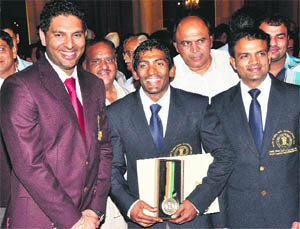 Olympic medallists Vijay Kumar and Yogeshwar Dutt were today jointly conferred the Rajiv Gandhi Khel Ratna award -- the country's highest sporting honour -- while an unprecedented 25 sportspersons were honoured with the Arjuna awards in a glittering ceremony at the Rashtrapati Bhawan here. Undone by spin in the first Test, the embattled New Zealanders are hoping that the overcast conditions here would favour their pace bowlers when they take on India in the second and final match of the series starting on Friday. “I have seen this kind of welcome only on television,” were the first words Prashant Chopra uttered after watching crowds waiting to greet him on his return to his home city today. England captain Andrew Strauss, who oversaw back-to-back Ashes wins over Australia and took the team to the top of the Test rankings, announced his retirement from professional cricket on Wednesday. Strauss, appointed in 2009, will be replaced by One-day skipper Alastair Cook. South Africa became the first side to be ranked No. 1 in all three formats after beating England in the second ODI by 80 runs. Having already dethroned England at the top of the world Test rankings this tour, Proteas replaced them at the top of the ODI rankings and are now top in all three formats. Australia's fast bowlers, led by man of the match Mitchell Starc, narrowly outshone Pakistan's spinners as Michael Clarke's side edged to a four-wicket win in the opening one-day international of their three-match series in Sharjah. Kingue Mpondo scored twice as Cameroon beat Maldives 3-1 tonight in the 15th Nehru Cup Football Tournament. The Hockey India is all set to the start the once popular Indo-Pak hockey test series from next year. 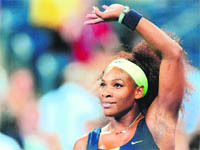 Defending champion Novak Djokovic and three-times winner Serena Williams each dropped just two games against bewildered opponents at the U.S. Open on Tuesday, leading a procession of top seeds into the second round of the year's final grand slam. Sania Mirza and Mahesh Bhupathi have decided to split as a pair, ending speculation over their future as a mixed-doubles team following the bitter selection row before the London Olympic Games. A loud applause greeted the two Olympic heroes as they received their Khel Ratna Awards from President Pranab Mukherjee in the presence of a host of Ministers, dignitaries and sports celebrities. Cricketer Yuvraj Singh, who is preparing to stage a comeback after recovering from a rare germ cell cancer, also received a thunderous applause as he received the Arjuna award with hordes of cameramen capturing his moment of glory. Pistol shooter Vijay had won a silver in the 25m rapid fire event at the London Olympics, while Yogeshwar bagged a bronze in 60kg free style event. Both the medallists collected the trophy that consists of a medal, citation and cash prize of Rs 7.5 lakh each. The choices were made by a selection committee headed by 2004 Olympics silver-medallist shooter Rajyavardhan Singh Rathore and comprised noted sportspersons such as Akhil Kumar (boxing), Khajan Singh (swimming) and Bhaichung Bhutia (football) among others besides a few bureaucrats. Normally only one award of Rajiv Gandhi Khel Ratna is given every year to an individual sportsperson. However, the scheme provides that this condition can be relaxed in exceptional circumstances like winning of an Olympic medal. Hockey mid-fielder Sardar Singh, wrestler Geeta Phogat, and Narsingh Yadav, shooters Annu Raj Singh and Omkar Singh, shuttlers P Kashyap and Ashwini Ponappa, archers Deepika Kumari and Bombayla Devi were among Arjuna Award winners this year. For the Arjuna Awards, normally not more than 15 awards are given in any calendar year but an exception has been made this time because it is an Olympics year. India won six medals including two silver and four bronze medals in London, which is the country's best performance in Olympic Games. Apart from Vijay and Yogeshwar, wrestler Sushil Kumar won a silver in the men's 66kg freestyle event while MC Mary Kom settled for a bronze in boxing in women's 51kg category at the London Games. Their pace bowlers are hoping to utilise the overcast conditions prevailing at the Chinnaswamy Stadium to their advantage in the second Test starting August 31. "At the moment the wicket looks nice and has a bit of grass on it, but I expect it to be removed before the Test begins. The overcast conditions here looks to be helping us and it might work in our favour," all-rounder Doug Bracewell told reporters here. The team, which lost inside four days in the opening Test, is also taking tips from talismanic skipper Daniel Vettori, who has been ruled out of the series due to injury. "We talk to him and he gives his thoughts. That is good for us. We are happy Dan is back in the set up," Kiwi he said. Bracewell said the wicket looked similar to the one given to the visitors in Hyderabad. Replying to a query, Bracewell said it is tough to be down in series but the team should forget about the outcome of the last match and only focus on the positives. "There is a lack of spinners back home. We don't have plenty of them. However, some young spinners are coming through. That is always good," he added. Meanwhile, curator Narayan Raju has predicted an exciting battle in the second Test, saying the pitch will have to something to offer to both the batsmen and the bowlers. "There is a tinge of grass on the wicket. But overcast conditions that are prevailing here will decide the course of the match. If the conditions improve, the spectators can witness an interesting battle between bat and ball," Raju said. He said swing bowlers would like the conditions here. Raju also said the ground staff has worked overnight to prepare the pitch, bringing in sand from Andhra Pradesh to give the outfield a fresh feel as the city has been experiencing heavy rain in the last few days. Chopra, back home after becoming a world champion as part of the Indian Under-19 World Cup-winning team, was enjoying the attention being lavished on him. His constant smile spoke of the importance he attaches to the victory, of the satisfaction he derived from the team’s success. Chopra said that he intends to focus on the immediate task ahead. “Now I will focus on the domestic level cricket,” he said. “The domestic season is right on the doorsteps and I need to give my best to move further in my cricket career.” “I’ll work hard and concentrate on overcoming my shortcomings, so that I can achieve more laurels — like my idol Sachin Tendulkar,” he said. First captained England in 2006 in the absence of the injured Michael Vaughan and Andrew Flintoff but dropped in 2007. Made skipper against New Zealand in 2008, where he scored a career high 177 and he became England's fulltime captain in 2009, succeeding Kevin Pietersen. In the 2009 home Ashes series, Strauss led England to a 2-1 victory over Australia. Alongside team manager Andy Flower, Strauss then oversaw one of the most successive eras in English cricket. A 3-1 Ashes series win in Australia (2010-11) was followed by a home 4-0 win over India which lifted the team to the top of the Test rankings. Stepped down as England's One-day captain after their quarterfinal defeat by Sri Lanka at the 2011 World Cup. As Test captain, Strauss led England 50 times for 24 wins. The match saw a record-breaking Hashim Amla, smashing a 124-ball 150, becoming the fastest player to 3,000 ODI runs as he reached the landmark in just his 57th innings compared to the 69 it took West Indies great Vivian Richards. The victory meant England ended their run of 10 straight wins. Amla’s 150, the highest individual score in ODI matches between South Africa and England, helped South Africa post a challenging 287 for five. In reply, England were dismissed for 207 with more than nine overs left. South Africa take a 1-0 lead in the five-match series after this victory.he first ODI was washout in Cardiff on Friday. Starc (5-42) and James Pattinson (3-19) were the chief wreckers as Pakistan were bowled out for 198 in the 46th over. Although Shahid Afridi (1-37), Saeed Ajmal (3-30) and Mohammed Hafeez (2-29) threatened to strangle the Australian reply, a calm 66 from Clarke and then crucial contributions from George Bailey (57 no) and Glenn Maxwell (38) meant they eased to win with 10 balls to spare. With this, Cameroon and India are through to the final with sevent points each. To win the title for the third time, India would have to do much better than they did against Nepal in a goalless draw yesterday. India probably didn’t want to risk injury to their key players on a wet pitch. The match was a reality check for the hosts, raising questions about their ability to play under stress. Dutch coach Wim Koevermans’ emphasis has been to strengthen the team in all aspects of the game, starting from the rear. The draw against Nepal exposed many chinks in the team. The coach conceded that India were under pressure to win to ensure a smooth passage into the final ahead of their last league match against Cameroon on Friday. Sunil Chhetri was bottled up to immobilise the Indian attack, but the midfield and the defence failed to check the Nepalese forwards. Subrata Paul under the bar was kept on his toes throughout the contest. 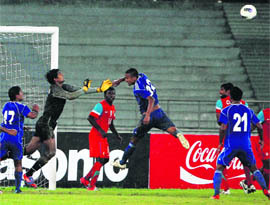 It was Subrata’s acrobatic jumps and dives that kept the Indian goal from harm’s way. Subrata Paul has become synonymous with consistency and his energetic, restless roaming at the goal-box is a reassuring sight for the team as well as the fans. Even if the last line of defence caves in, Subrata can be depended on to save the citadel. His signature saves had played vital roles in India winning the Nehru Cup in 2007 and 2009, particularly the two superlative saves he made off penalty kicks. He really arrived on the national stage when he made three crucial saves off penalty kicks in the Under-23 Pre-Olympic Tournament against Myanmar. His big moment came thereafter, when he replaced Sandip Nandy as the No. 1 goaltender for the 2007 Nehru Cup. 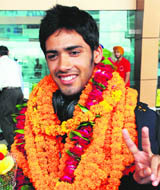 He returned to the India team after a gap of one year when Koevermans took charge. When Koevermans took over, he had put thrust on strengthening the defence. Subrata has quickly taken to Koevermans’ style of coaching, though he feels it will take time to “settle down to a new system”. But he had no doubt that Indian football was is on the right course under the Dutch coach. In a bid to improve India's ranking as well as give the senior team a chance to play higher ranked nations, HI secretary-general Narinder Batra said that a series with Pakistan on home and away basis will be a mandatory fixture in calender. "The basic planning will be to play against Pakistan plus against two other top-ranked nations every year. We have already sent an invite to Pakistan's hockey federation for a series next year. The following year (2014), we will be touring Pakistan. Apart from Pakistan, we plan to play against Australia, the Netherlands, Great Britain, Spain, Germany on a regular basis." According to association's master-plan, there will be an India 'A' team or development squad which will be the bridge between the national U-21 and the senior squad. "Often, we find that some of the U-21 players who show a lot of promise are left in the lurch once they make a cross over to the senior level from age-group hockey. For them, we have decided to have a development squad or 'A' team which will act as a supply line for the senior side." In another significant development, the Hockey India may take back promising drag-flicker Gurjinder Singh who had signed with the rebel World Series Hockey (WSH) championship. Joining Djokovic in the winner's circle at Flushing Meadows were number five Jo-Wilfried Tsonga, number six Tomas Berdych, and former champion Andy Roddick, the 20th seed. On the women's side, former world number one Caroline Wozniacki was a first round casualty while second seed Agnieszka Radwanska and number six Angelique Kerber advanced easily. Djokovic took just an hour and 13 minutes to blitz Italy's Paolo Lorenzi 6-1 6-0 6-1 in his first-round match under the lights on a cool evening at Arthur Ashe Stadium. The charismatic Serb's win was so one-sided that it was difficult to tell if the 2011 U.S. Open champion was that good or Lorenzi had perhaps the worst evening of his life on a tennis court. "My game was great from the start to the end," said the second seeded Djokovic, who won three of four majors last year. "It's also important for me to try to be as economical with the time I spend on the court as possible, but obviously not underestimating any opponent. "I played really focused, tried to get to the net also. It was great all in all." The 69th-ranked Lorenzi said he had trouble with the blustery conditions before a sell-out crowd of nearly 24,000 at cavernous Ashe Stadium. “I had never played on the center court and there was a lot of wind," he said. "So sometimes I'd miss an easy ball because the ball was flying a lot. But he's playing so good. I tried my best." Fourth-seeded Williams followed Djokovic on the court and produced a 6-1 6-1 rout of 75th-ranked American Coco Vandeweghe, who committed 22 errors and produced only nine winners against the 30-year-old, 14-times grand slam champion. Williams said the conditions were tough on both players. “I usually gauge the wind by my hair," she said. “If it's really going forward, I'm thinking, 'It's really windy.' "It was really gusty, so at some points it would be really windy, at some points it wouldn't be ... I didn't hit anything too hard because the ball, I wouldn't have known where it was going to go." World number two Radwanska of Poland showed no signs of a shoulder injury that forced her out of the New Haven tournament last week as she routed 91st-ranked Nina Bratchikova 6-1 6-1. Hampered by a knee problem, eighth-seeded Wozniacki never broke the serve of world number 96 Irina-Camelia Begu of Romania and lost 6-2 6-2. "You always want to go in and do your best no matter what's happening out there," Wozniacki said softly. "I tried. I didn't play particularly well, made too many errors. “It's unfortunate because it's a huge tournament, a tournament you want to play well in.” Venus Williams overpowered Bethanie Mattek-Sands 6-3 6-1 and in the process clocked the fastest women's serve of the tournament to date at 124 mph. Now ranked number 46, Venus said she yearned to get back into the world top 10 but conceded "it never happens the way you want it to." "That's one thing I found out throughout my whole career," said Venus, who was forced to withdraw from the tournament shortly before her second-round match last year after discovering she had an auto-immune disease. "When you don't make it to one goal, just make some more. But, of course, I'm looking forward to the top 10, all that great stuff. I feel like I have it in me." Like Venus, Roddick is trying to re-capture the form that saw him win the U.S. Open in 2003. On Tuesday, he cruised past 21-year-old American qualifier Rhyne Williams 6-3 6-4 6-4. Roddick said "the game has gotten significantly better" than when he won the title. "I had a massive serve at 135 (mph), and this kid today was hitting them that big," he said with a smile. The two players are playing with different partners at the US Open. Sania has teamed up with British doubles specialist Colin Fleming while Bhupathi is playing with Czech Andrea Hlavackova at the last Grand Slam of the season "Our commitment was only up to the Olympics and we both thought we needed a break after all that has happened in the recent past," Sania said from New York. The selection row had resulted in straining the friendship of Sania and Bhupathi as an angry Sania had alleged that she was used as a “bait” by the tennis association to pacify a disgruntled Leander Paes, with whom both Bhupathi and Rohan Bopanna had refused to play at the Games. Paes was forced to play with the lower-ranked Vishnu Vardhan and in compensation he was assured the pairing with Sania in the mixed-doubles event. Sania's preferred partner was Bhupathi, with whom she won 2 Grand Slams, but she was not consulted by the AITA. 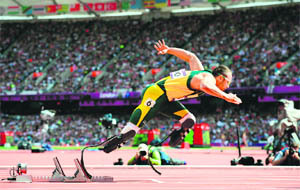 “I ran in Athens but up to the beginning of that year I didn't know much about the Paralympics," said Pistorius. "I didn't know the guys' names who lined up beside me for my first race. I think the biggest turn-out was 20,000 on one Saturday, on the rest of the days it was between seven and 12,000. "Four years later in Beijing you had full houses most days but the perception was still lacking I believe in not only disabled sports but in people living with disabilities. In the last two or three years there has been such a shift really with the excitement building up to Games. “Athens was such an amazing experience. I wish I had got involved in Paralympic sport earlier. It has been the most amazing last eight years. With this being my third Paralympic Games I'm a little envious of all the youngsters who are going to be able to step out on the track for the first time and experience this because the Paralympic movement has grown so, so much over the last eight years. It's been great to see the transformation of the sport.